OLK to EML converter software all user to convert OLK14Message and OLK15Message file into EML file format. The software also export olk14source, olk14msgsource into eml format. It ensures that the complete data will be converted into emails format. After successful conversion of OLK file data to EML format the software provides naming conversion option to save resultant file. Use can save data by subject, date, from or the combination of these attributes. Select this feature from advance feature setting. Filter the required data from large olk file. 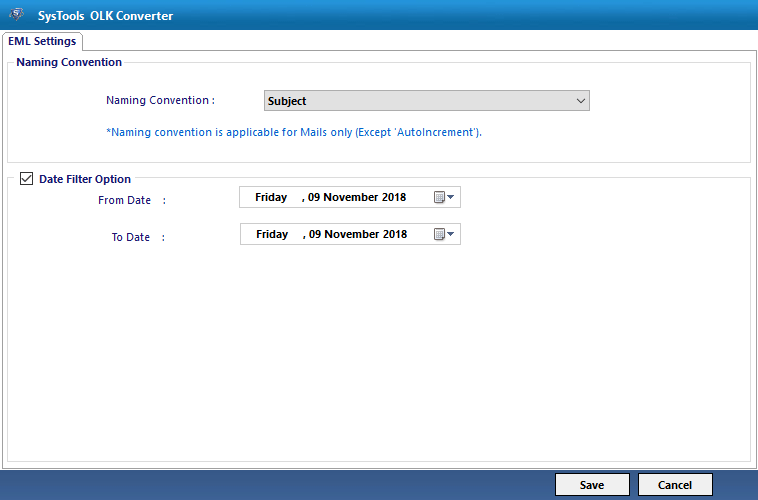 Simply apply the date based filter in which you need to just provide date From to To and the olk to eml converter tool will automatically select only those files which are sanded between the provide dates. User will find this feature in advance setting option. User can select required files or folders by clicking in check box. This option is very helpful in case of large olk file. Simply select the important files form olk folder and software will convert the selected files into EML format. It is time saving option and makes conversion fast. If user want to save resultant eml file in same folder hierarchy as it was saved in olk file. Then select the maintain folder hierarchy option from the bottom of software window. It ensures that all the converted data will be saved in original folder structure. 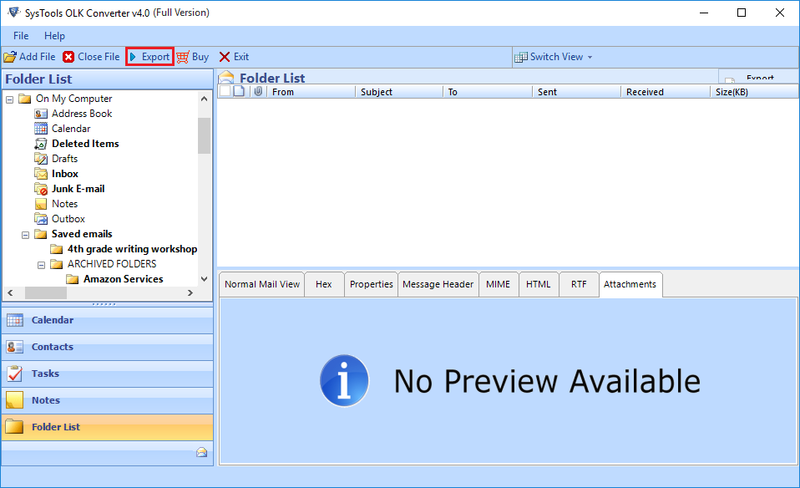 Mac Outlook creates outlook14message or outlook15message file for each incoming or outgoing mails. The olk to eml converter support bulk olk conversion so user can export multiple olk file simultaneously. It is highly used feature for fast conversion of entire data. Does software support naming in bulk conversion process? 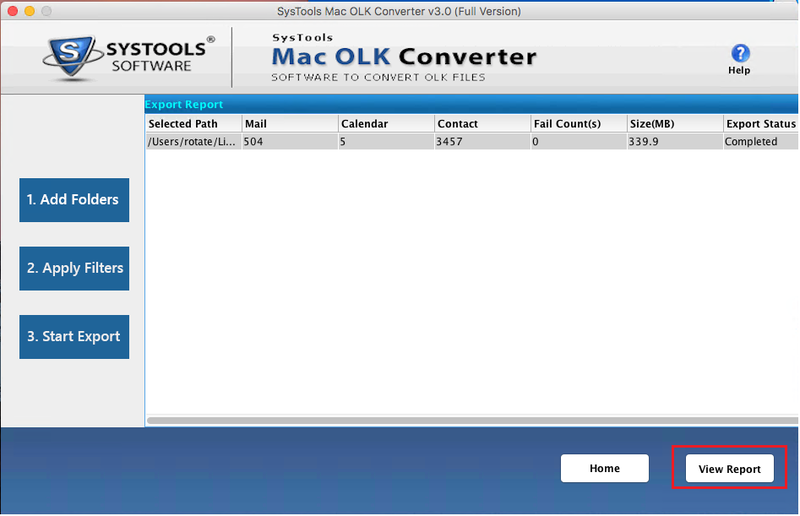 Yes, the olk to eml converter tool provides naming conversion feature for bulk olk conversion. Yes, the converter tool is compatible with windows 10, windows 8, windows 7, windows vista and all its below versions. Can I convert single selected olk file into eml format? Yes, the software supports selected data conversion. Simply check the required data and right click on it and hit on export option. How to created .dmg file from .olk file? Simply compress the .olk file and you will find resultant .dmg file. What is the use of ~temp folder while converting olk file to eml format. The software provides preview option to view scanned data before applying converting it. So it save data temporary in temp folder. By default it stored in C: drive, If there is not enough space then its location to other drive partition. Now select the EML radio button and hit on Adv. Setting to apply advance features. Now check the required feature like Date Filter and Naming Convention and click on the Save button. "I have two year old olk file and I want to convert it into EML format. Then I searched on internet for olk to eml converter software and downloaded free demo version of the software and analyse the working of the software. Then I purchased full version of the tool and converted entire data into email format. Thanks to the development team." "I stored many olk file in single folder and compressed it and found .dmg file. After some time I need to convert some file into eml format. Then I purchase OLK to EML Converter Tool, It posses many featured like export selective files and apply date filter. These feature helped me a lot in converting selective data. The support team help me while performing conversion process. " 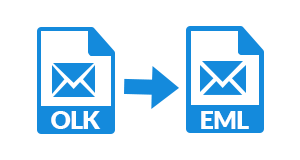 The OLK14 to EML migration tool can transfer complete message data with proper formatting to .eml files. The application works with the conversion of both OLK14mesage and OLK15message files. The tool extracts message body and attachments from an OLK14 message source and transfers to EML format. Collectively transfer multiple OLK14message or OLK15message files to EML format in bulk. There is no limitation imposed on the file size or number of OLK messages. 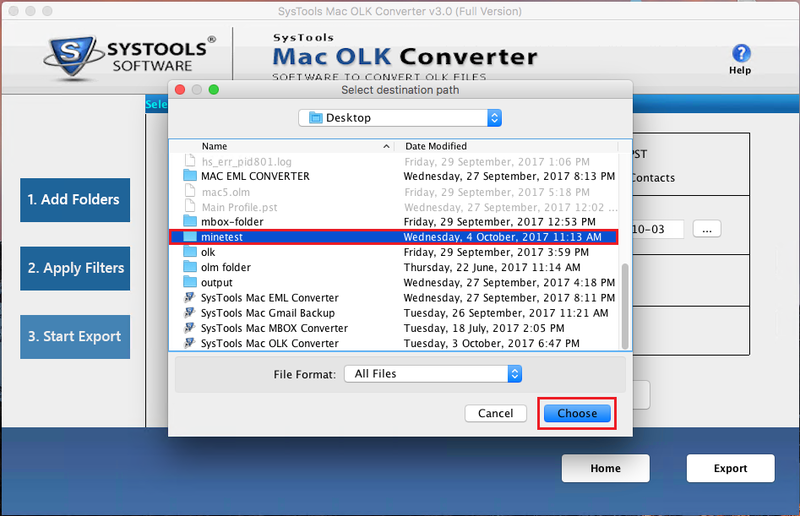 The OLK File to EML Converter is compatible with all versions of Mac OS X 10.10 including OS X Yosemite 10.10.4 and 10.10.5. The tool also works with Mac OS Sierra Version 10.12.3. 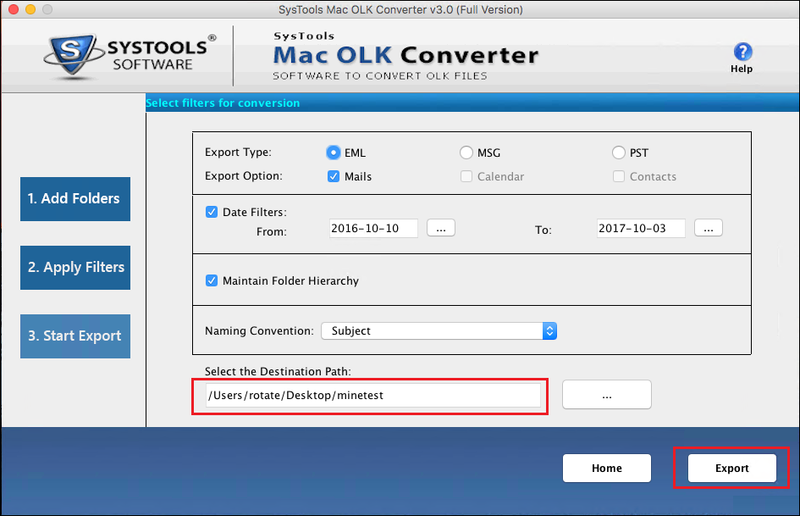 There is an option provided by the OLK to EML Converter for Mac tool to selectively migrate data. This is a feature to apply email filtering to OLK message files based on a date range. Just set a ‘to’ and ‘from’ date to restrict conversion to a certain time period. This will save time and prevent any needless conversion of data. The Mac OLK File to EML Converter allows a user to pick a suitable naming convention for the resultant EML files. This can be based on a serial number, subject or date the message was received. This gives unique identification to each .eml email that will be exported as a result of using this tool. The OLK15message to EML emails will be named based on the user’s choice. It is optional to maintain folder hierarchy in exported .eml files when using the OLK14message to EML Converter. This option only speeds up the entire process of conversion as the tool need not adhere to the folder structure. At the end of the export procedure, a complete progress report can be saved in CSV for future reference. 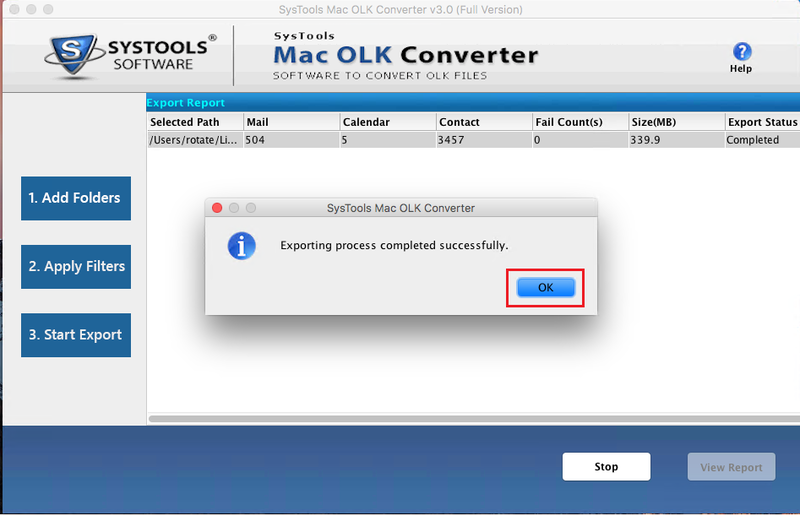 The Mac OLK to EML Converter software generates a complete live status report during migration. This includes information regarding the select path, email count, the contact count and the calendar items count. A progress status and size of the OLK14message file is also displayed. What are the prerequisites to using this software? Users need an Outlook for Mac 2011 or 2016 to work with this application. Also, Java development kit 1.8.0_101 is also necessary on the migration machine. 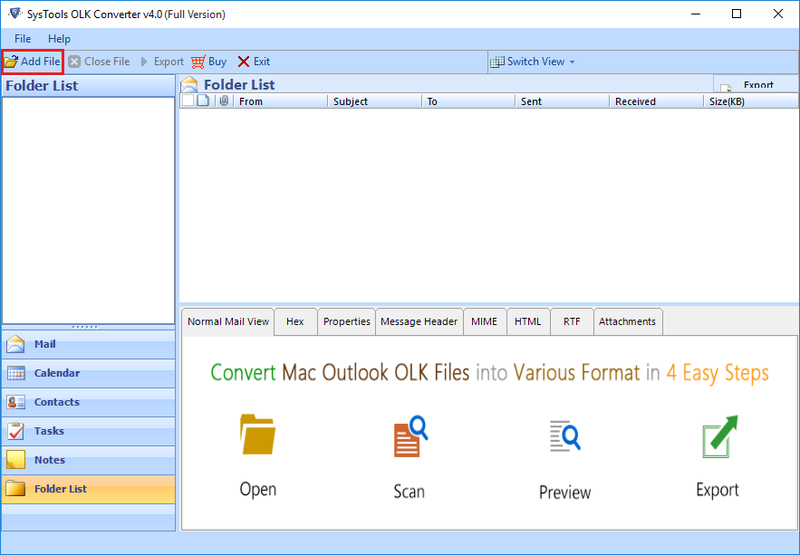 Is Outlook Installation required to open OLK files on Mac using the tool? Yes, MS Outlook installation is not a prerequisite to open OLK15 messages in Macintosh computer. What is the difference between the free and the full version of the software? All the features are same. The only difference is that the free version can only migrate 25 items per folder. Is this an OLK File to EML Converter available for Windows users as well? Yes, there is an OLK to EML Converter available for all versions of Windows. 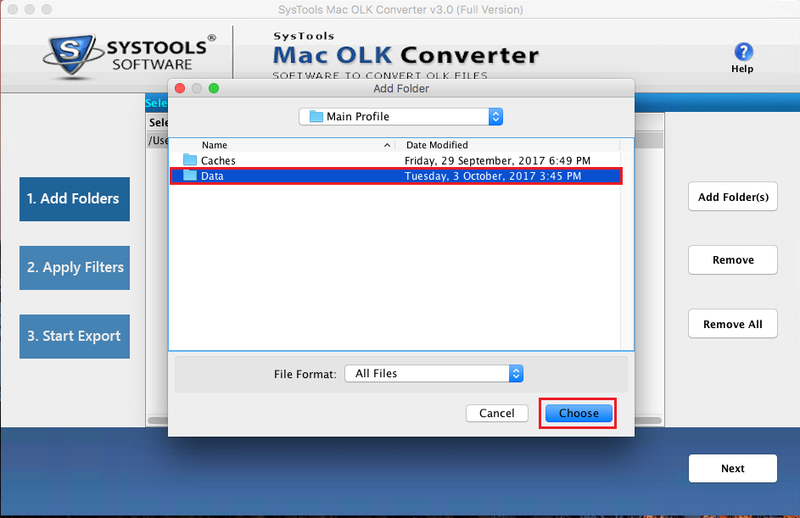 Can the tool export data from a corrupted OLK14Message File in Mac? No, the tool can only migrate to EML the healthy, non-corrupt OLK files. Next, click on the Add Folder button. Then, Browse to the location were the OLK14Message files in Mac are saved. Select the folder and click Choose. 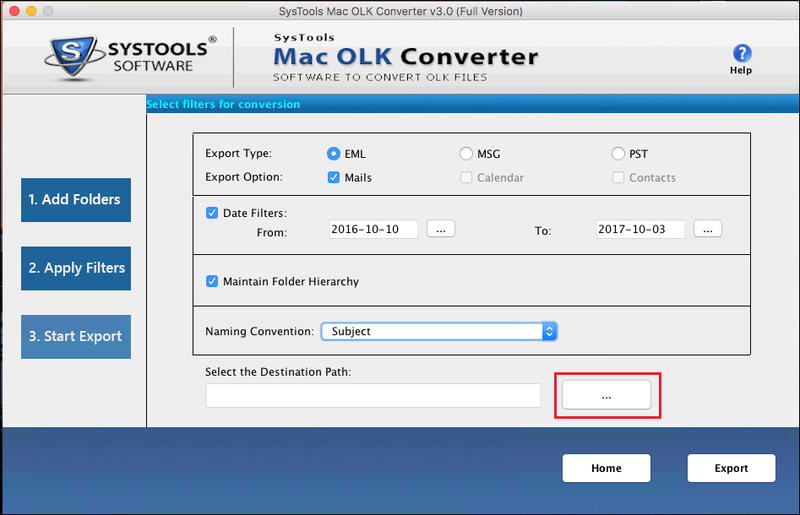 View all the OLK14Message files added to the OLK to EML Converter for Mac tool with path and size. Then, click Next button. From the Export Type section, select EML option to migrate OLK14messages to .eml format in Mac. 2. 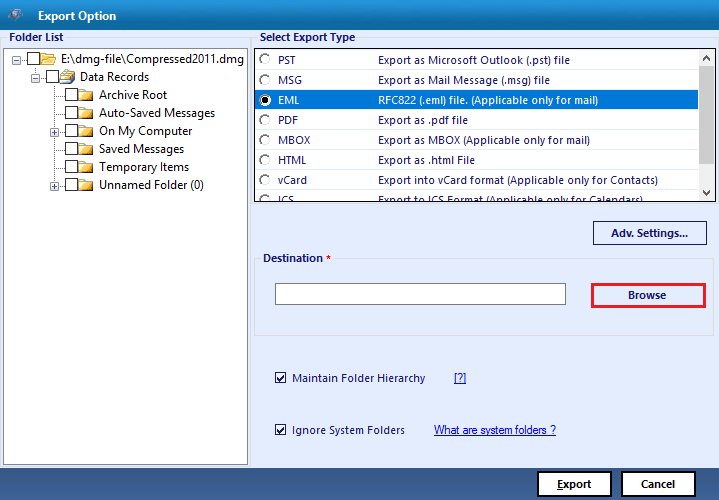 Maintain Folder Hierarchy: Optional to keep folder structure intact in resultant EML emails. 3. Naming Convention: Set a naming pattern for resultant output EML files based on a number, subject or date. Next, click on the ‘...’ button to set a destination location where the emails will be saved after OLK to EML conversion. After the OLK to EML Export process has been completed successfully. Click on the OK button to confirm the message box. To save the OLK15 to EML export report, click on View Report button. This will open a folder explorer window were the OLK14 to EML Export report is saved in CSV. "This is an easy-to-use, user-friendly software that has been designed for every type of user. It has a simple interface that can even be used by a non-technical user like me. The Mac OLK to EML Converter is the best solution for converting OLK15 and OLK15 message files to EML format. It did so without any changes to data or email formatting." "This is an amazing software! Using the Mac OLK File to EML Converter, I was able to migrate over 4000 emails saved in an OLK14Message format my Macintosh computer. It is completely easy to handle and export files using the tool. This is the best OLK to EML Converter for Mac available in the market. I want to thank the development and support team for there efforts."